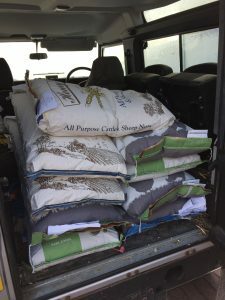 Direct farm supplies offers a variety of delivery options to help make your experience as easy as possible. We deliver locally using our own vehicle, this is free if you are within 10 miles of our store in Quedgeley GL2 4AL east of the river severn. The Property we deliver to must have it’s own private access without crossing another persons property to get to it and off road Parking must be available for unloading with plenty of turning room to avoid reversing onto the public highway ( we don’t class muck heaps as a suitable turning area). Minimum spend may apply if you our quite far away from us. This is particularly popular when large volumes of animal feed are purchased. This option is only available to Gloucestershire postcodes only excluding GL1. Please select weight based shipping at checkout if you are not in Gloucestershire. We send farm supplies to farms and smallholders all over the UK. This method is charged by weight. This delivery method is not a particularly good way of sending bags of animal feeds as costs soon mount up. We only ship within the mainland uk. We aim to despatch your order within three working days.Once the courier is booked your farm supplies order is complete and should be with you by 16.00 the following day. Some restrictions apply regarding the size of items which we will be unable to ship. This will usually be mentioned in the product details (mainly with Wydale feeders). The weight displayed is not necessarily the exact weight of the item. A signature will be required and further charges may be incurred if the item/s are returned to Direct farm supplies. This option is no longer available for animal feed deliveries. If items are out of stock or we have part of the order we will wait until they arrive from our supplier before sending them to you. You may be asked for further delivery charges if you require us to do two deliveries. If collection is displayed at checkout without any other options this means you have a collection only item as part of your order I.e. dairy chemicals or large items. This may also be displayed in the product description. Completing any order with this delivery method selected will mean that we are expecting you to collect from us irrespective of the address provided. Some items are only available online and will be shipped to the delivery address you provide us with, direct from our supplier. These are mainly Gallagher, Pulsara and Birth alarm products. We will usually notify you when your order is ready for collection. Please bring order confirmation with you for security reasons. The information on this page forms part of the terms and conditions and they may change at any time without prior notification.